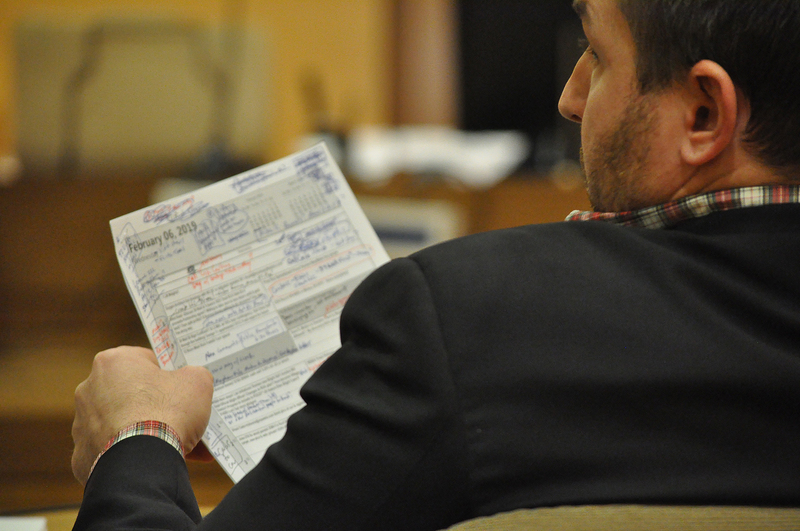 Norwalk real estate broker Jason Milligan, Wednesday in Stamford Superior Court. NORWALK, Conn. – Jason Milligan’s legal entities took multiple hits Wednesday as the judge in the lawsuit filed by the Norwalk Redevelopment Agency and the City of Norwalk ruled against his legal motions. Judge Charles Lee denied Milligan’s motion to dismiss the plaintiff’s application for an injunctive order and ruled against a request to further delay depositions demanded by the plaintiffs. Another legal entity in the case, mortgage company CC Rivington, was ordered to divulge its members and provide multiple documents requested by the City and Redevelopment Agency. The Redevelopment Agency and the City are suing entities controlled by Milligan and Richard Olson of POKO Partners because Olson sold Milligan properties slated for use in the Wall Street Place project, commonly known as “POKO.” The City is involved because it contributed a former municipal parking lot at 23 Isaac St. as land for the development. The plaintiffs say, in court filings, that the documents they are seeking go to the “very legitimacy of the transaction.” They are critical to “the paramount issue of the irreparable nature of the harm of condoning and inviting transactions similar as the one at issue here which threaten, at a very fundamental level, large scale municipal revitalization infrastructure projects,” Redevelopment Attorney Joseph Williams and Assistant Corporation Counsel Darin Callahan wrote. Lee’s order means that the LLCs involved in the dispute and their relationships to Milligan will be illuminated. This prolonged hearing process, which began in early December, is simply for a temporary injunction to stop Milligan from doing anything with the properties until the lawsuit is settled. Plaintiffs have to show a probability of winning their case to get the injunction. Lee on Wednesday allowed every one of the plaintiff’s requests for information to go through, save the one demanding “any and all documents regarding the members of CC Rivington;” Lee changed that to simply explain who the members are. CCRivington for a time held the $5.8 million mortgage on the five POKO properties, after acquiring it from MC Credit, which had the Redevelopment Agency’s approval as a lender to POKO Partners, the approved developer. The plaintiff’s complaint, filed in September, accuses Milligan of engaging in unfair trade practices by using sham corporations to white-wash a prohibited transfer of property. It states that on the date Milligan’s Wall Street Opportunity Fund (WSOF) bought the properties, WSOF granted another Milligan entity, Komi Ventures, mortgages on the properties for $5.2 million, and at the same time CC Rivington “collaterally” assigned its $5.8 million note to a Milligan entity, Komi Ventures. If accurate, then there is $11 million of debt on properties appraised by the Norwalk Tax Assessors as being worth $4.2 million. A motion filed Jan. 25 by Williams reveals that on Jan. 4 the Milligan defendants produced the loan participation agreement the plaintiffs had been seeking; it shows that upon transfer of the properties WSOF advanced CC Rivington $5.1 million for, among other things, an assignment of the $5.8 million MC Credit mortgage and a release of the same mortgage. “It appears CCR agreed (and did) grant WSOF what, by all appearances, is a legally inoperative assignment of the MC Credit Mortgage,” Williams’ motion states, explaining that the release wasn’t filed in the land records nor disclosed to the City and Redevelopment Agency. The assignment, however, was recorded and used to justify Komi’s deed-in-lieu foreclosure on WSOF in July. Milligan at the time said the transfer negated the City’s legal actions attempting to reverse the sale. Milligan has been saying that Komi is now the lender on the properties, and has standing from a redevelopment perspective in the same way that Citibank does on POKO Phase I.
Lee, in Wednesday’s brief hearing, ordered CC Rivington to provide documents about the transfer of the properties. The plaintiff’s request for the documents dates to Nov. 21; Rivington’s attorney claimed that he did not receive the request and asked to delay their production until March 5. Lee gave Rivington until Monday. CC Rivington will also be required to give a deposition. Rubin had also filed a motion to join in CC Rivington’s request to delay production of documents but on Wednesday said 80 percent of the defendants’ objections had been worked out and he’s working toward an agreement with Williams and Callahan. He could produce about 2,000 pages of documents and isn’t withholding any documents, he said. Lee rejected Rubin’s legal arguments in Rubin’s attempt to dismiss the plaintiff’s amended injunction. “It’s funny, when I think I’m going to win that’s when – it just seems like it’s off balance in terms of my predictions. To me, this is the easiest motion that we have filed,” Rubin said. “A motion to dismiss the complaint, you are trying to cut down the tree. A motion against the injunction is just taking off a limb,” he said. Lee said he wants the hearing to wrap up by mid-March and set the next court date for March 4. Williams promised to have transcripts of depositions expedited so the schedule could be kept. After the hearing was adjourned, Milligan did not use his customary phrase, “hashtag winning,” but instead referred to the money the City and Redevelopment Agency are spending on lawyers. Milligan has said his legal bills are up to $100,000 and suggested that taxpayers are on the hook for more. He had assumed he’d be in discussions with the City after buying the properties, not in court, he has said. The City and Redevelopment Agency decline to comment on the litigation. Mediation with Citibank to restart construction on POKO Phase I, aka “the Tyvek Temple,” is said to be ongoing.